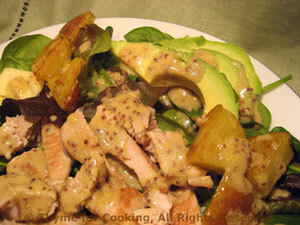 Salad with Turkey, Potatoes, Avocado, Thyme for Cooking summer recipes. You can do the potatoes and turkey in a skillet or on the barbecue grill. The time is about the same. Use a mix of greens if you can. Cook on barbecue grill for 4 - 6 minutes per side (depending on thickness) or sauté in nonstick skillet for the same amount of time. Divide and arrange on 2 plates. Divide and arrange potatoes, turkey and avocado.